Persistence Market Research offers an eight-year forecast of the Europe sporting goods market between 2016 and 2024. The primary objective of the report is to offer insights on the advancements in the Europe sporting goods market. The study demonstrates key market dynamics that are expected to influence the current environment and future status of the Europe sporting goods market over the forecast period. The report provides latest updates on trends, drivers, restraints, value forecasts, and opportunities for manufacturers operating in the Europe sporting goods market. The Europe sporting goods market report has been categorically divided into two sections based on market segmentation – by product type and by country. The report begins with an overview of the Europe sporting goods market and describes the factors and restraints likely to impact the market in the next eight years. This section also includes impact analysis of key regional growth drivers and restraints based on the weighted average model along with key region-specific trends to better equip clients with useful information and insights. 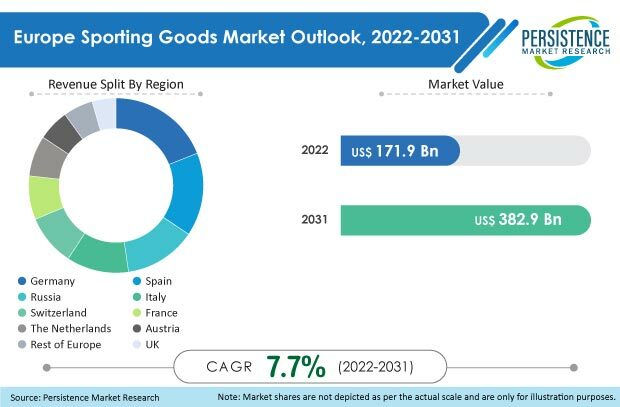 The subsequent sections analyze the Europe sporting goods market on the basis of product type and country and provide a comprehensive market forecast for the period 2016 – 2024. This study also discusses key drivers and trends contributing to the growth of the Europe sporting goods market across the different countries and analyzes the degree to which drivers are influencing the sporting goods market in each country. A section of the report discusses how the overall competition in the market is steadily increasing and highlights the various factors shaping internal as well as external competition in the market. Various barriers for new entrants are analyzed and rated on the basis of their impact on the competition levels in the Europe sporting goods market. The final section of the report outlines a detailed competitive landscape of the Europe sporting goods market to provide report audiences with a dashboard view of leading players operating in the Europe sporting goods market. Comprehensive profiles of service providers and distributors are included in this section to evaluate their long-term and short-term strategies, key offerings, and recent developments in the Europe sporting goods market. Key market competitors covered in the report include Adidas AG, Nike Inc., Under Armour Inc., PUMA SE, Amer Sports, Odlo, Hammer Sports, Polar Electro, KETTLER, and WaterRower Inc. The Europe sporting goods market report utilizes extensive primary and secondary research to ascertain overall market size, top industry players, top products, industry associations, etc. The report incorporates various viewpoints based on secondary research. Furthermore, data points such as market split by product type and by country and qualitative inputs from industry experts have been taken into consideration to arrive at suitable market estimates. The report begins by sizing up the current market, which forms the basis for forecasting how the market is anticipated to take shape during the forecast period. Given the ever-fluctuating nature of the global economy, the report presents forecasts not only in terms of CAGR, but also analyzes the Europe sporting goods market on the basis of key parameters such as Year-on-Year (Y-o-Y) growth to understand market predictability and to identify the right opportunities in the Europe sporting goods market. Another key feature of this report is the analysis of all key segments in terms of absolute dollar opportunity, critical in assessing the level of opportunity that a provider can look to achieve, as well as to identify potential resources from a sales and delivery perspective in the Europe sporting goods market. Further, to understand key market segments in terms of growth and performance in the Europe sporting goods market, Persistence Market Research has developed a market attractiveness index to help providers identify real market opportunities in the Europe sporting goods market. In terms of value, the Europe sporting goods market is anticipated to register a CAGR of 6.6% during the forecast period 2016 – 2024, and is expected to be valued at € 187.48 Bn by 2024 end. The primary factors powering the demand for sporting goods are an increasing prevalence of obesity due to a modern and hectic lifestyle and increasing health and wellness awareness among the female population in Europe. A hectic modern lifestyle, increasing intake of high-calorie processed food, and prolonged desk-bound jobs are major causes for increasing prevalence of obesity among the population in Europe, which is in turn fueling the demand for sporting goods to improve the quality of life. Also, growing prevalence of obesity is driving the demand for fitness-related sports equipment and encouraging end users to increase their spending on sporting goods. Furthermore, increasing disposable income in major European countries is expected to drive revenue growth of the Europe sporting goods market over the forecast period. One of the major restraints for the growth of the sporting goods market in Europe is the increasing time spent on the internet, mobile device games, and other related non-physical activities by the younger generation that is reducing their interest in physical sports. This trend has diminished the demand for sports goods and products in Europe and is one of the main factors hampering the growth of the Europe sporting goods market. The Europe sporting goods market is segmented on the basis of product type into Football, Teamsports, Tennis, Bike Sports, Racket Sports, Outdoor Sports, Water Sports, Running, Winter Sports, Golf, and Other Sports. Each of the product type segments are further sub-segmented into Apparel, Equipment, and Shoes sub-segments. Among all the product type segments in the Europe sporting goods market, the Football segment is projected to be the fastest growing segment over the forecast period and is estimated to account for 24.8% market share of the Europe sporting goods market by the end of 2016. The Teamsports product type segment is expected to be the second largest segment in terms of value, anticipated to hold a market share of 16.5% in the Europe sporting goods market by the end of 2016. The Europe sporting goods market is segmented on the basis of country into Germany, France, Italy, Spain, Austria, Switzerland, Netherlands, and Rest of Europe. The Football segment is expected to remain dominant in the Germany sporting goods market throughout the forecast period and is estimated to hold 30.5% value share by the end of 2024, followed by the Teamsports segment, which is expected to account for a value share of 19.7% by 2024 end. In 2015, the Rest of Europe sporting goods market was valued at € 62.25 Bn and is estimated to increase to € 66.95 Bn by the end of 2016, reflecting a Y-o-Y growth rate of 7.5%. Adidas AG, Nike Inc., Under Armour Inc., PUMA SE, Amer Sports, Odlo, Hammer Sports, Polar Electro, KETTLER, and WaterRower Inc. are some of the leading companies operating in the Europe sporting goods market. Adidas AG is one of the leading manufacturers operating in the Europe sporting goods market, engaged in the design, development, production, and distribution of athletic and sports lifestyle products. Nike, Inc. designs, develops, and distributes athletic footwear, apparel, equipment, sports accessories, and services. PUMA SE is one of the leading companies in sports and sports lifestyle products such as footwear, apparel, and accessories. Leading market players are focused on strategic collaborations and expansion activities to increase their footprint throughout Europe.